What is it? – Gravity Tumble (or Tumble) is a physics-based puzzle game where you rotate each maze-like level to get to the exit, while avoiding traps and hazards. Who made it? – The game was developed by Paul Woolley of ClockWorkHammer. How does it play? – You’ll use the arrow keys to rotate screen. Pressing the down arrow will stop the level rotation dead in its tracks. Your only goal for each stage is to use your rotating skills and gravity to get your rainbow-colored ball to the golden exit orb across 20 levels. Your progress will be impeded by various obstacles. 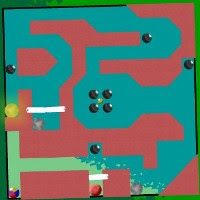 Doors must be manipulated to allow your ball through, stationary black orbs will cause death upon collision, red orbs are just like black ones that are affected by gravity, and moonrocks will get in the way of your ball while also unbalancing your maze-rotating efforts. Presentation – While not exactly an eyesore, the game’s presentation is very basic. The units and obstacles are all very discernible from one another, but the game doesn’t pack much visual punch. Positives – What the game lacks in visual pizazz is made up for by some very good level design and use of physics. Some of the puzzles are quite tricky, lending the game some longevity. The game also saves your progress so that you can take breaks between the tougher puzzles, as necessary. Negatives – The game is a solid and fun effort overall, but is presentationally eclipsed by other similar games like bipole and Sola Rola. Gravity Tumble is also quite a bit more difficult than either of those games, which may lead to frustration with some more casual players. Why you should play it – Despite its visual simplicity, Gravity Tumble has enough physics-based-puzzle goodness to satisfy. It’s not the most innovative or prettiest kid on the block, but the gameplay that’s offered is challenging and satisfying.